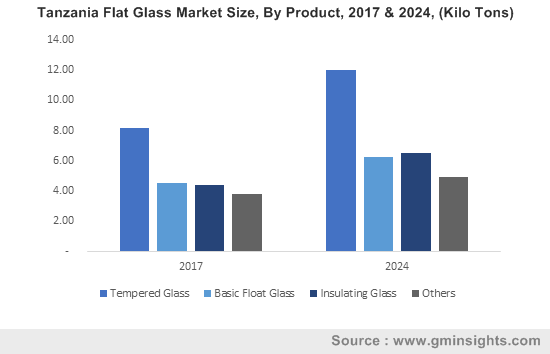 East Africa Flat Glass Market size was over USD 145 million in 2017 and industry expects consumption at over 140 kilo tons by 2024. Rising investments in infrastructure development accompanied by favorable government & trade regulations, and rising population are likely to accelerate construction growth majorly in Ethiopia, Mozambique, Rwanda and Tanzania. Increasing development in the building & construction sector is majorly driving East Africa flat glass market growth. Construction market in East Africa constituted of approximately 70 projects in 2017 with total value exceeding USD 30 billion thereby accelerating the infrastructure industry in the region. Rising demand from the construction sector is predicted to create growth opportunities for products such as partitions, roofs, staircases and beams which will further foster East Africa flat glass market demand. Tanzania construction sector shows rapid growth owing to increasing residential & non-residential buildings and roads, which may accelerate East Africa flat glass market. High economic growth accompanied with rising investments from public and private sectors may create growth opportunities in the East Africa flat glass market size. These products include laminated, tempered and insulating types, are highly versatile and incorporated into windows, doors, table tops, handrails, skylights and greenhouses. The furniture market in Kenya was valued at over USD 500 million in 2016 and is expected to grow at significantly owing to increasing spending on interior refurbishments to accentuate the appeal and inclination towards modernization. Increasing trend of energy efficient and smart buildings coupled with upcoming infrastructure projects and supportive government initiatives may stimulate the product demand. Insulating products used simultaneously with low-e-glass provides effective energy conservation and means to comply with building codes. The government is taking efforts to ensure that only Eurocode-complaint building materials will be allowed entry in the market by 2021 which is further expected to stimulate the East Africa flat glass industry growth. East Africa flat glass market growth is stimulated further by the developing automotive industry driven by population growth, economic growth and rising income levels. Kenya automotive sales was over 11,500 vehicles in 2017 and is expected to increase as many established brands such as Toyota, Simba Colt and General Motors are expanding their sales network in the region. Tempered glass market demand may expect significant gains close to 5% over the forecast period. It is manufactured by thermal treatment for increasing its strength and is considered four to five times stronger than other counterparts. These products are considered as a safe alternative as it shatters into tiny pieces in the event of breakage thereby minimizing the possibility of injuries and stimulating the East Africa flat glass market demand in the automotive segment. Flat insulating glass market demand may witness high growth in the forecast period. It mainly comprises of multiple panes with air spaces which slows down heat transfer, thereby making them ideal for buildings such as hotels, houses, and hospitals. Rise in concerns to lower energy usage with growing need to reduce carbon emissions should fuel product demand. Flat laminated glass may expect consumption close to 40 kilo tons by 2024. It is produced by fixing a polyvinyl butyral (PVB) sheet, which makes these fragments stick to PVB sheet upon breakage, thus ensuring safety. It is preferably used for skylight construction and manufacturing vehicle windshields, thereby promoting East Africa flat glass market demand. East Africa flat glass market from construction applications was valued at over USD 115 million in 2017. Rising demand for windows, partitions, doors, floors, stairs, bathrooms and walkways is predicted to accelerate industry growth. Increase in new residential construction projects owing to rise in infrastructure spending & favorable government schemes should fuel product demand. East Africa flat glass market demand for aftermarket automotive applications may witness significant gains close to 4.5% by the end of forecast period. Laminated and tempered products are highly used in vehicle windscreens and side windows owing to their safety properties of shattering into tiny fragments thereby reducing the possibility of injuries. These products also find applications in backlite wrapping and vehicle roofs. Kenya flat glass market demand was valued at over USD 30 million in 2017. Rising automotive sales driven by GDP growth, rising foreign & government investment, easy credit facilities, rising vehicle exports to Uganda and Tanzania and increasing heavy vehicle sales are the primary factors influencing growth in the region. Ethiopia flat glass market size is expected to witness significant gains at over 5.5% over the forecast period. Booming construction sector driven by the major projects coupled with favorable investment environment are the major factors contributing to industry growth. The country’s automotive industry is likely to witness rapid gains owing to an untapped automotive industry and rising commercial vehicle exports thus increasing regional market share. 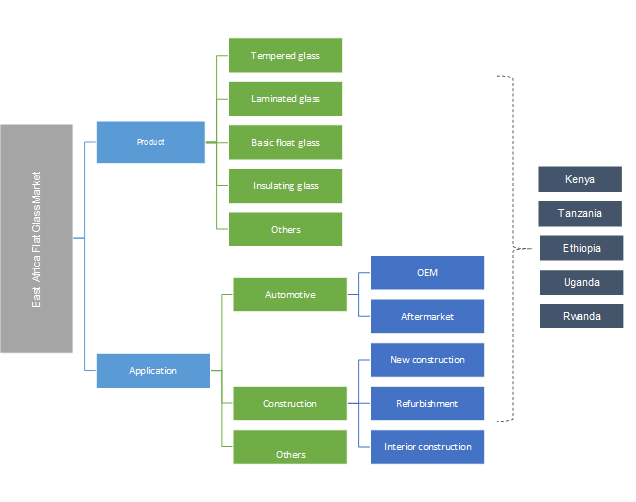 East Africa flat glass market is significantly competitive and fragmented among multiple participants such as Saint-Gobain, Impala, Cadasp Hebatullah and Kings Manufacturers Ltd. Rising demand for these products in the region is drawing international manufacturers to the regional market owing to the presence of few domestic manufacturers and strong reliance on imports. In February 2016, Chinese company Glass Industry Group of Africa constructed product facility in Tanzania with approximately 600 tons per day production capacity to achieve East Africa flat glass industry expansion in the region. Flat glass is made from melting raw materials such as soda lime, dolomite, silica sand, magnesium and calcium oxide in a furnace followed by spreading the molten crystal in sheets of a desired thickness and cooling to obtain the final product. These products contain high content of sodium oxide and magnesium oxide as compared to its other counterparts. These are generally produced by float technique and are also manufactured by rolling or overflow downdraw techniques. The advantages associated with these products are their capability to be bent after production and increasing usage in automotive and architectural applications such as windshields, windows, roofs and partitions, which may accelerate East Africa flat glass market demand.